Halloween is my favorite holiday because it’s the one time of year you can dress up and pretend to be someone else – or if you’re crazy like me, dress up seven days in a row. I may be delusional, but I thought it would be a good laugh if I created seven different costumes for “Halloweek” (because let’s be real, in college, there’s more than one day to celebrate). Although I was determined to create all of these different costumes, I’m a broke college kid on a budget. You might wonder how I could possibly get a full costume for under $30, and the one answer I have is: budgeting. Why go to an expensive Halloween store when you could just get it from goodwill? As much as I love this holiday, I know that I will probably only use a costume once, so price is important. Olivia Perreault | Perreault gets into character as Velma, losing her glasses. It’s easy to come up with a basic costume like a cat or a witch, which I’ve definitely done before, but I think creating an original costume makes the holiday more interesting. Here are three of the best costumes that I bought and made for this year’s Halloweek. 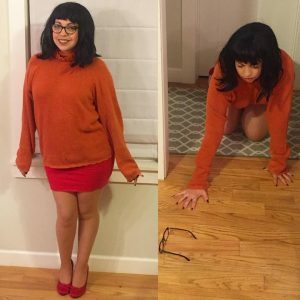 “Jinkies!” Velma from Scooby Doo is a super easy costume and very cheap to create. Luckily, I already wear black-rimmed glasses, so I just needed to look for a shirt, skirt and black bob. I found a black wig with bangs for $8 online and then stopped at Savers to look for clothes, where I bought an orange turtleneck sweater for $4 and a short red skirt for $2.50. Lastly, I paired the outfit off with short red heels that I purchased from a consignment store for $5. The great thing about Katy Perry is that she has thousands of different outfits you can replicate. She has iconic outfits like the Katy Beth Terry outfit from “Last Friday Night,” the spinning peppermint dress she wore on her “Teenage Dream” tour and the Cheetoh bag she dressed up in for one Halloween. However, my favorite costume of Perry’s is the Dots candy costume, which she wears in her “California Gurls” music video. To create this costume, I ordered an $8 leotard from H&M, found an $8 long haired blue wig at Savers and bought two packages of styrofoam balls from Walmart for $2 each. I cut each styrofoam ball in half, and then split them into three groups of 12 halves. 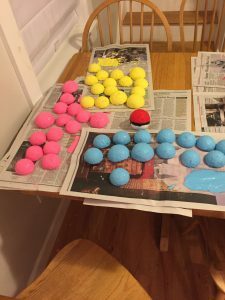 I painted one group blue, another pink and the last one yellow. After they dried, I hot-glued the halves to the leotard and paired the outfit with galaxy-patterned heels. Gotta catch ‘em all – but with the right outfit! Misty is a character in the Pokemon franchise who is a “gym leader.” For this look, I found an $8 orange wig from Savers, red Trend Suspenders and a $5 yellow short-sleeve shirt from Walmart. I cut the shirt to make it into a crop top, and found a simple pair of jean shorts and red converse to complete the outfit. To make Misty’s hair, I cut the wig in half and pulled the hair to one side. Then, to add a final touch, I used an extra styrofoam ball from my Perry costume and painted a pokeball. No matter what you chose to be this Halloween, make sure it’ll be remembered!